It's been ridiculously hot (for the bay), but with Penga-sis over for a visit we couldn't help but fire up the stove for another round of soap molding. 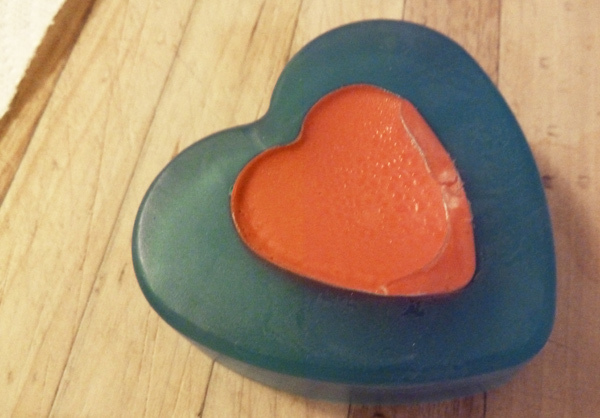 This particular one, a classic Zelda heart container, uses some pretty standard silicone molds. 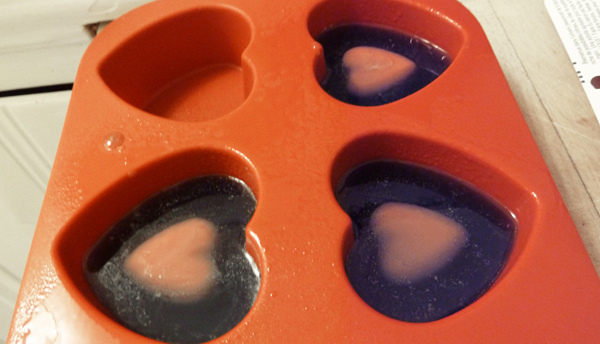 A small heart ice cube mold and a large heart baking mold. 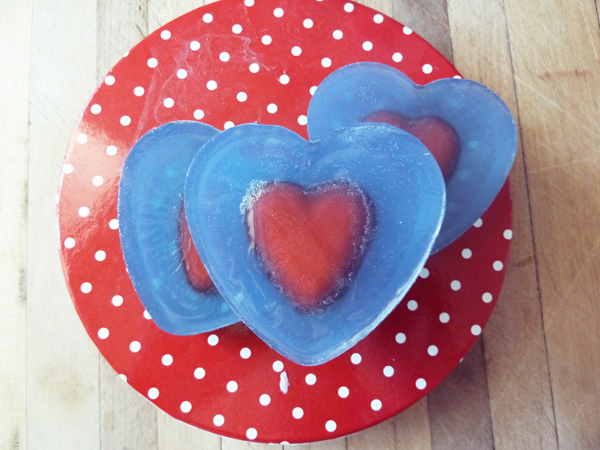 First we made some small hearts with shea butter soap. I screwed up the food colors though, so it's not quite the bright red I was going for. :P After the soap cooled we put them inside the larger molds (sprayed with rubbing alcohol to reduce bubbling). 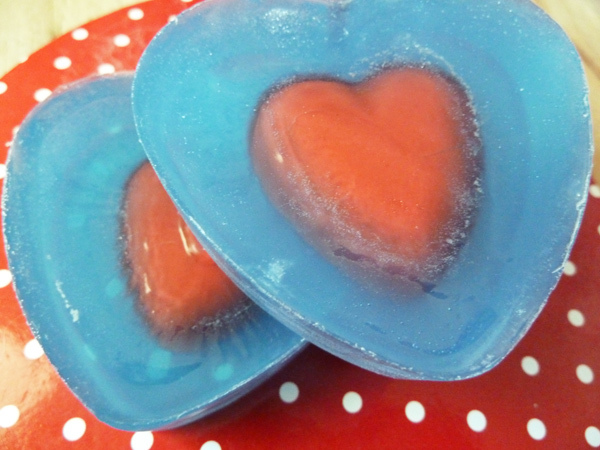 Next we used some clear glycerin, some honey almond scent, and some blue color. Again, the colors are not quite right. It should be a much more subtle blue color. Poured into the mold just over the red hearts. Cool and pop out! This is in full sun. Kinda pretty eh? The back is not so great though. At night, backside of soap. I should have put a layer of blue before putting the red heart, so that itd be "floating" in the middle. But then there'd be a line? Hmm. Well, until next time, it's kinda cute! It is SUPER cute! Does the glycerin have to get pretty hot to melt? 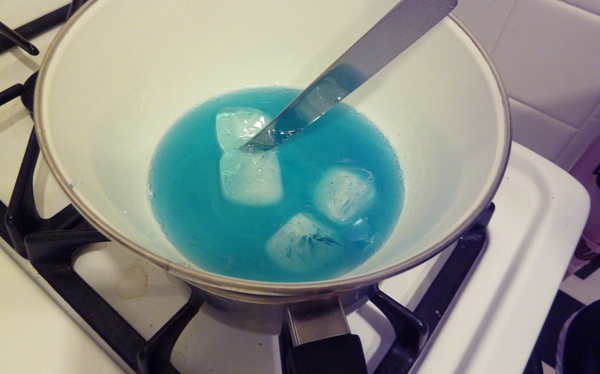 I would have worried the little heart would have re-melted a little when you poured the blue! They turned out so cute.